Birthday blessings for a sweet niece! Wish your niece a birthday full of sunshine. Remind her of how wonderful, brave, and beautiful she is. 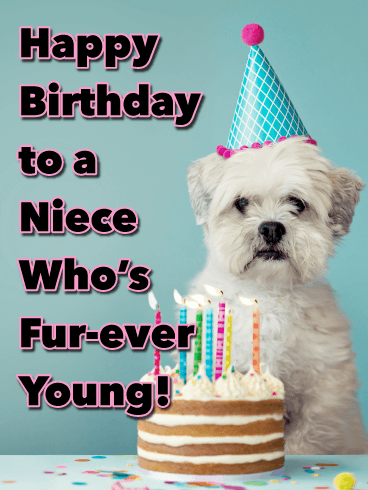 Your niece is a very special girl and this birthday card lets her know it! 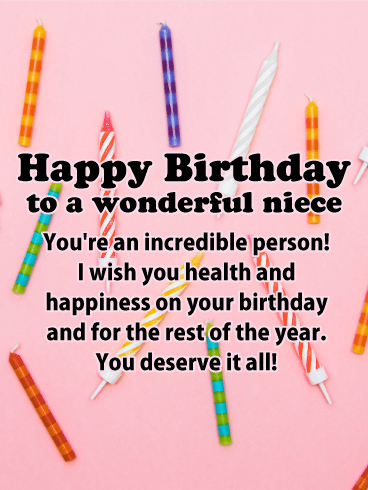 Whether you live near or far, wish your niece a happy birthday and a terrific year with this fresh and fun birthday greeting card. 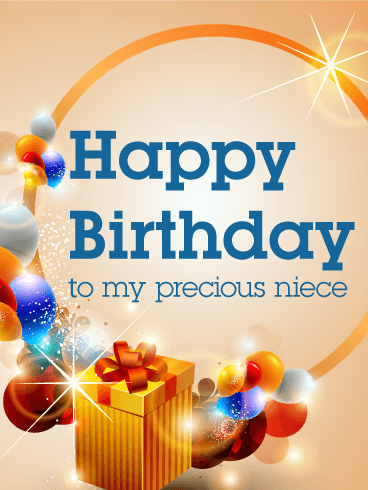 A thoughtful birthday card is a great way to celebrate your niece's special day. 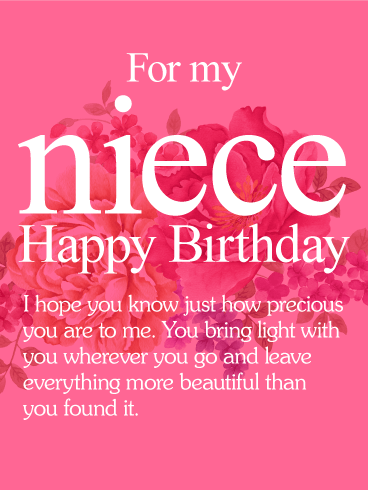 Happy Birthday to my sweet niece - May the sun shine brightly on your very special day, and may you always know your true worth. You are a brave and beautiful soul. I wish you the happiest of birthdays, and wonderful year! 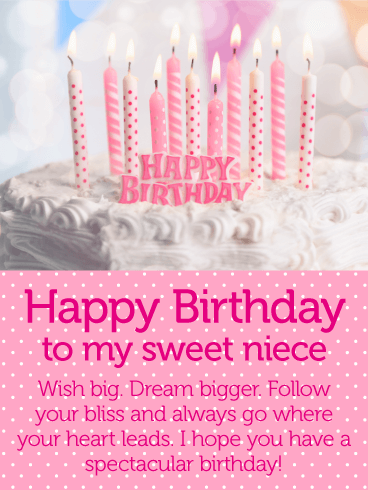 Make your niece's day sparkle with this beautiful birthday card! Filled with many stunning balloons, magical glitter, and a beautiful box all bathed in a golden light, this card is as precious as the birthday girl. It's perfect for letting your niece know how special and treasured you think she is. Send her your sincere wishes and affections with this birthday card. Nieces are sweet like cupcakes. Indulge in some pink-a licious cupcake goodness for your niece's birthday this year! Your niece will adore this yummy birthday card made especially for her. Delicate pink frosting and tasty pink sprinkles-yum! 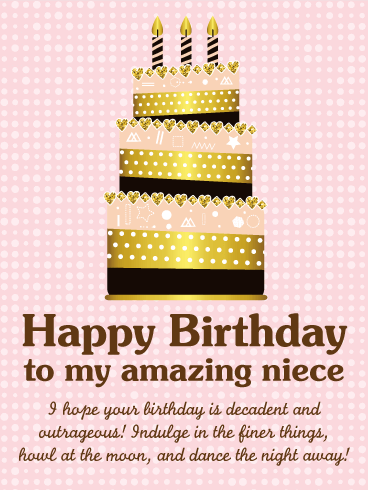 This birthday card is a delectable and brilliant way to send warm birthday wishes to your favorite niece. The birthday card looks good enough to eat! 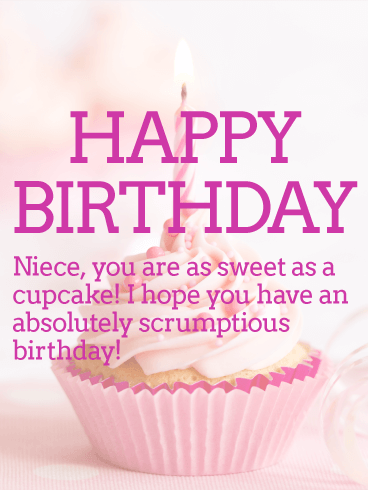 Send a pretty birthday card to your niece and let her know you're wishing her a scrumptious day! 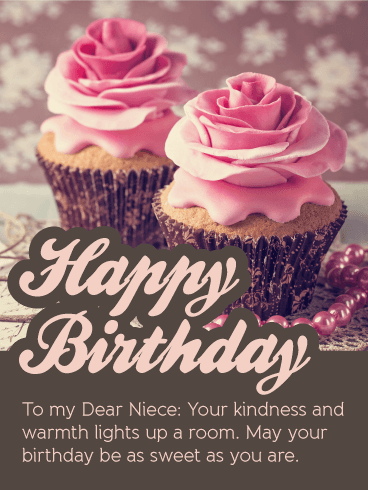 An elegant and vintage-inspired birthday greeting for your grown niece is a beautiful way to wish her a happy birthday this year. We cannot always be close to the ones we love on their birthdays, but we can always send warm wishes their way. Cupcakes and roses are a lovely way to wish your niece a happy birthday. Our beautiful birthday cards are easy to send and guaranteed to warm hearts. To strong and vibrant women. To a niece full of beauty, light, and life. This gorgeous, floral birthday card is perfect for a fabulous niece. Wish your niece the happiest of birthdays with this incredible greeting card. A stunning birthday card is just the thing to make your niece feel extra fabulous on her birthday. If it has been your joy to know her and watch her grow, this tender card is perfect for you to send. For a sassy niece who likes to party, this glittery birthday card is perfect! Let her know she can kick off her heels and be a little wild on her special day. Birthdays should be fun, decadent, and outrageous. Send her this fantastic birthday card to help her celebrate in style. She'll love the message and adore the sparkling and chic birthday cake. Send a birthday card that reminds your niece to dance all night and enjoy herself to the fullest! Bringing light and leaving beauty. Your niece is a precious woman with so many gifts and talents. Send her a sincere and thoughtful birthday card to wish her a very happy birthday, and remind her just how wonderful she is. 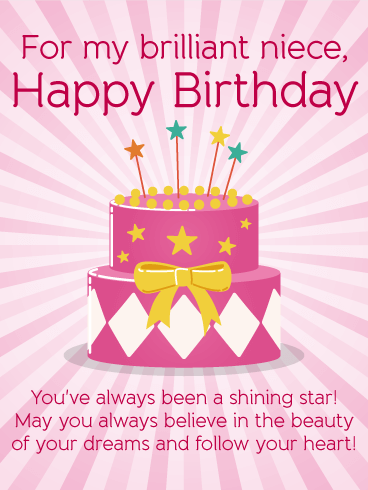 On your niece's birthday, take a moment to share your love and send an encouraging birthday card to light up day. Stunning simplicity. Tender thoughtfulness. This lovely birthday greeting card will thrill your niece and bless her birthday with its warm message. Wish your niece a birthday filled with surprise and a year full of dreams come true. It's the thought that counts, and this gorgeous birthday card is truly the most thoughtful thing you could send your niece on her special day. Follow your bliss on your birthday! 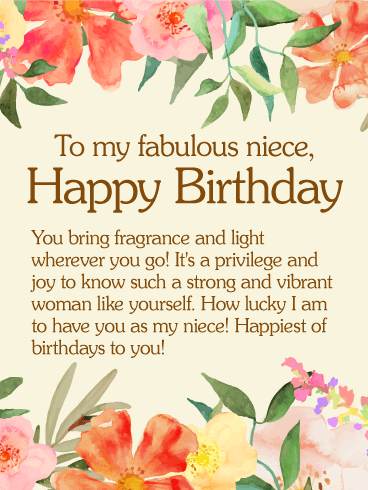 Wish your sweet niece a spectacular day with this pretty birthday card. Remind your niece to follow her heart and dream big today and every day. Send your niece a birthday card she will cherish and adore. The encouraging message is just right for a new year and new dreams. Birthdays are for wishes and sweet thoughts! Thrill your niece with this gorgeous and sweet birthday message today. Follow your heart! Birthdays are for dreams and wishes. Wish your niece the happiest of birthdays with this encouraging birthday message. Celebrate her light and life with an awesome birthday card that will brighten her day. Your niece is brilliant, so her birthday card should be too! Send a festive birthday cake card and let your niece know she's always been a shining star in your book. Birthday blessings and a day filled with every grace. 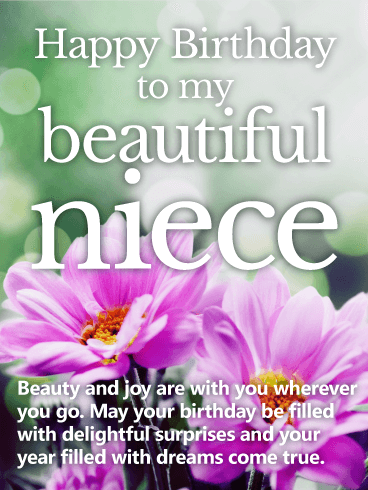 Wish your niece a happy birthday with a thoughtful and beautiful card. 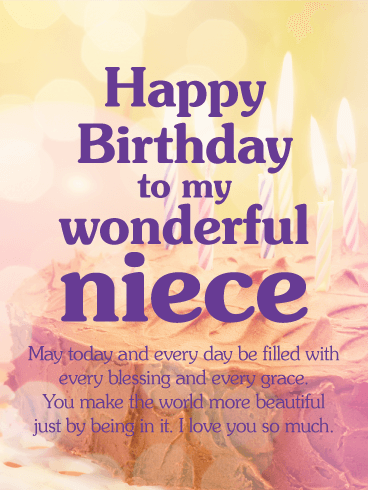 This tender birthday card will show your affection and shower your niece in love and sweet blessings. 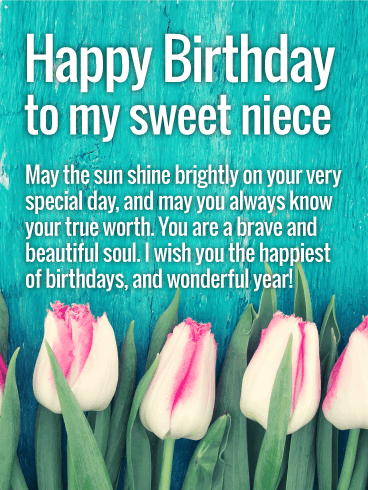 Take a moment to send your wonderful niece a sweet message on her birthday. It will warm her heart to receive this beautiful birthday card.